Every great blog post consists of three parts. Whenever Nicholas talks just imagine Lord Palmerstoke. The second part is called “the turn.” In this part of the blogpost, we mention that we finally figured out what’s going on with the Mac build and why it was throwing Lua errors all the time. This has been fixed, and will be pushed to the experimental build for further testing, once the next experimental revision goes up. We will also quickly note that Linux support is coming along as well – we are now mainly waiting on the additional work to get it building over here and not just on Ryan’s machine, but I think we now have all the pieces. Again, we’re sorry this is taking so long, for those of you on alternate operating systems. The third part of the blog post is called the Prestige Menu. Concept art, from David, for the Prestige Menu. Text and contents of Prestige Menu will be different in final product. We will now drown one programmer in a water tank. * Which evokes some great feature ideas, actually. How about we take a moment to expand not-so-briefly upon the point of Prestige? So, given: our concept of Prestige acts as a sort of general-use currency to allow the player to “buy” game effects. We can dress up how the player “earns” this currency however we can twist the narrative to support and, likewise, we can allow the player to buy anything we can make sound plausible. There’s a potential pitfall and a potential gain here. First, the pitfall would be that generic currency could make the economic game generic, choiceless, and therefore uninteresting. As in, just earn lots of points somehow and solve any problems magically. We’re going to have to carefully avoid this as we iterate the design. It may turn out that almost all of the economic effects should just be shoveled into the Trade system. What we could gain is related: if we give players a way to generate this generic currency that can fill gaps in production lines, this should theoretically allow them to specialize their colony in one or a few areas which may not even relate to generating commodities at all. Maybe farming and metalworking is your passion and you make a ton of products. Great! But if it’s not, Prestige would be able to flesh out the somewhat more abstract “successes” that don’t involve shoving commodities in and out of machines. Maybe you’re a player who just loves making really nice houses for rich people who will then be really happy about all their nice stuff – this should be a legitimate colonial niche that would allow a player to “purchase” what their limited industry (and Trade) might not be able to fulfill. Likewise, natural & archaeological scientific discoveries could provide Prestige to an exploration-focused player. Likewise, fighting battles. This has nothing to do with the blogpost, just a rejected shot from the screenshot pile for the last update. But, uh. You could imagine that shooting those bandits would earn your colony some prestige, right? Right. Anyhow, that’s where we are this week. Oh, and unpacking the new offices, which are very nice even if the sun is extremely bright now that we have windows and can see the sky for the first time since we started making video games. We also miss the pigeon. 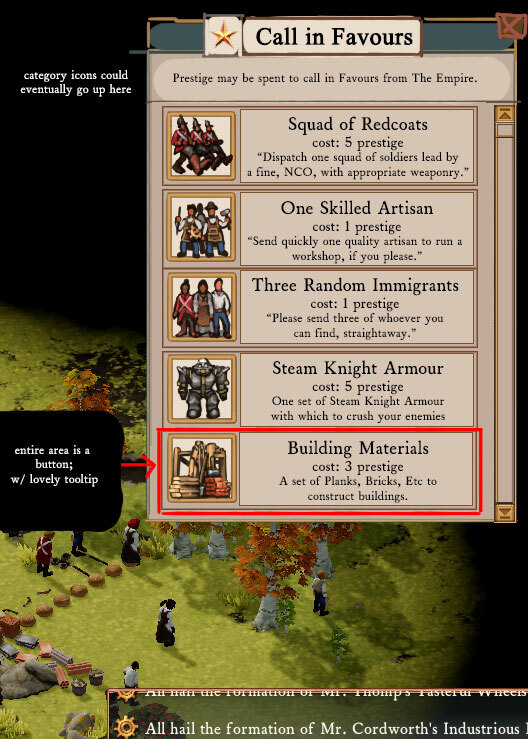 Posted in Clockwork Empires	| Tagged but is this a good blogpost, expansion pack confirmed: Faust & Partner Trading Company, look morty if this is a stupid ui mockup then the prestige movie is a stupid movie okay, Nicholas continues to fire shots in an attempt to kick off a hip-hop style feud with peter molyneux, please don't ask about the holiday christmas party, water hasnt been delivered to the new office for a week so weve been forced to tap into the strategic tequila reserve, we just need to get David Bowie involved somehow and it'll sell itself, where does nicholas keep finding these old ui mockups? So… about that holiday christmas party….? Can you go into more detail about the zoning changes? I really like the sound of the prestige system as a separate currency. One thing I’ve seen work well with “magic” currency systems is to give them a kind of “acceptable use” limit, beyond which they still work but are less effective. It’s like spending the night at a friend’s place – if you do it once or twice a year with a good reason then it’s a favor; if you do it every week then it gets old pretty fast. I’d suggest having the prestige system track month-to-month rather than event-to-event; not so much “you shot a bandit, yay, people immediately like you 5 points more” as “this month your village killed some bandits, explored uncharted regions, found an ancient shrine and exported rare goods; your prestige has increased by 30 points”. This has two nice effects – it simulates the time taken for news to get back to the Capital and be gossiped about; and from a gameplay side of things it stops players from spamming prestige every time they do something prestigious, instead adding a kind of soft time-limit like a paycheque… don’t spend it all at the start of the month and you have some emergency funds in case you need that air-drop really badly. Then, if the player is “banking” prestige each month the air-drops happen quickly; if the banked prestige is high enough the Capital might even be more ready to send aid – after all, these guys never need help so it must be important this time, right? 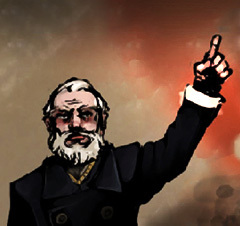 On the flip side, colonies that are constantly asking for help (or who ask for help several times in a short period) would lose favor with the Capital; so calling for assistance might require spending more prestige to keep the same effects up; or alternatively the effect could drop away so that if you ask for a squad of Redcoats you may only get a partial squad with poor training and equipment. I know you guys will have interesting mechanics lined up for trading, so the prestige system may well work better as just “miracles” with a set cost; but I’d love to see a favor system where you balance your popularity against the patience and generosity of the entities you’re calling aid from. Of course, any Other Sources of Assistance should be a little more fickle; but then I half expect they’d be easier to please (in the short-term at least) than the bureaucrats in the Capital…. Monthly reports that require an accountant you say? Doesn’t that kind of thing just make people shoot one bandit per month then, in order to maximize potential? Sounds like a great opportunity for micro-transactions!! The previous commenter’s idea seems really nice to me. Less an instant reward, more of an XCOM style monthly thing. You might even be able to tie the rewards in there – each month you get an update on how well you did, more prestige points as a result AND take delivery of the things you ordered throughout the month. (this might even allow you to do cool rate-limiting stuff; you can only get 2 steam knight suits per month, as The Empire’s Production Lines can only spare so many for a backwater colony. Maybe part of the campaign incentives could be loosening the purse strings of the Empire somewhat – bigger allowances, more monthly rewards, etc). After all, it’s a far-off colony, instantly delivering stuff has always felt a bit weird to me. PS: Oh man thinking about this it really seems to come together: Her Majesty has taken a Sudden Interest in all things Archaeological; as such for the next two months, any Discoveries in that araena will be rewarded with extra prestige! Et cetera. You know, the method by which prestige is earned also effects what it is and who can use it. As they said, making it a generic ‘achievement’ resource (earned by doing x of y) makes it bland end semi-exploitable, while making it ‘event’ based (as in, a bandit team arrives and only killing ALL of them gives you the bonus) would be more interesting. I mean, a colony earning prestige one way cannot earn it another. “This Colony is renowned for shooting things, but don’t go there if you want a nice plate with good food”. If that’s the a thing, then events themselves must be interesting. I can only kill a bunch of goons so often before it just becomes the regular burst of currency, not unlike the achievement-based method. Another option would be satisfaction based. Lots of dead enemies, good food and nice housing makes a colony great. Somehow balancing which party takes the priority would shift, again, WHAT colonies can earn it in the desired amounts. A final idea could be score, but this one’s a mess. Score means the game must either prioritise whatever the player scores best in (giving a negative to spread out colonies) or give a generic score (Which, like achievements, is bland). Score would be derived from general LACK of unhappiness, resource count, production over a period of time, quality of goods, etc. Man, when you actually thing about it, game design is hard. I’m glad ReaLife worked out as well as it did. Immediately after posting this we had a long conversation about how this interacted with the proposed trade system and how it could be Not Good. We reached a lot of the same conclusions you all did, and actually going back to some design notes we had from over a year ago, we prophetically saw this coming catastrophe and decided to just end the calendar at today. More specifically we also figured out how to avoid this problem, and we’re Implementing Ancient Knowledge as we speak.